The Snow Leopard Information Management System (SLIMS) is a standardized technique for surveying the status and distribution of snow leopards in the wild. It was developed in 1996 by the International Snow Leopard Trust (ISLT) under the leadership Dr. Rodney Jackson and Dr. Don Hunter of the US Fish and Wildlife Service. 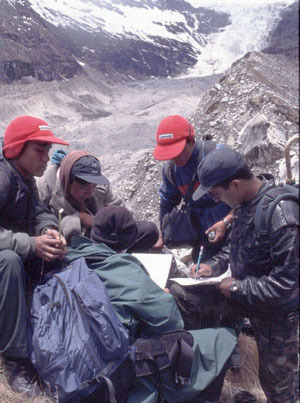 The aim was to develop simple field techniques for establishing the presence/absence of snow leopards in a particular area (First Order Surveys), and then to estimate their relative abundance (Second Order Surveys) from the amount of sign (scrapes, scats or feces, pugmarks and scent-sprayed rocks) found during a targeted search. ISLT agreed to coordinate the collection and storage of information, and to facilitate sharing of information at periodic international symposia. Rodney Jackson has trained national park staff, biologists, and village leaders in Bhutan, China, India, Nepal, Mongolia, Pakistan and Tajikistan in SLIMS methods and their application. You may download a PDF of the SLIMS 3-volume manual. What other information should be gathered?